giant stride away, off the resort's dive dock. The resort's dive operator, Hilltop Divers, offers a complete and wide range of services, from air fills to a full retail shop, a variety of rental sets, rinse tanks and showers. The dive portion of a Caribbean Club Bonaire package can be exchanged for an adventure package that includes man grove kayaking, cave snorkeling and mountain biking. Extremely popular with families who have multiple interests, Caribbean Club Bonaire also features the Hilltop Bar and Restaurant which, like the rest of the property, offers excellent value for money. 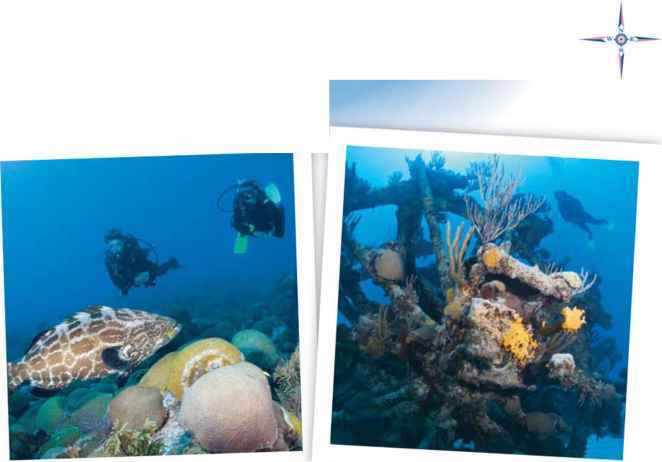 A great value in resort experiences on the island where the diving never sleeps, Carib bean Club Bonaire is your key to some of the best diving in the Caribbean at a price that invites you to bring the whole family. SunBreeze Hotel puts you right in the heart of Belize's Ambergris Caye while simultaneously offering a personal haven for scuba divers. The SunBreeze Hotel provides its guests with easy access to island and mainland happenings. 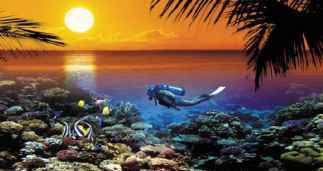 The SunBreeze Hotel offers a variety of scuba and non-scuba packages all year round. SunBreeze Hotel's 42 generously spaced, air-conditioned rooms provide guests with modern comforts including cable television, direct-dial telephones, ceiling fans and daily maid service. Additional amenities, such as safety deposit boxes, pool towels, complimentary coffee from 5 a.m. to 7a.m. daily and 24 hour front-desk service are avail able. SunBreeze's on-site, full-range PADI Resort dive shop, Aqua Dives Belize, offers daily morning and afternoon dives along with all courses. SunBreeze's oceanfront Blue Water Grill and Bar is among San Pedro's favorite restaurants. Art of Touch massage studio completes your vacation with a little pampering. SunBreeze's on-site dive operation, with shop, dock and boats conveniently located on the resort's waterfront. Nine boats (two 36s and seven 43s) divide up the guests nicely, so no one dives in a crowd. Great wall, reef and wreck dives on the barrier reef are only minutes away, including Shark Ray Alley and the Hol Chan Marine Reserve. It's only a short run to Lighthouse Reef or Turneffe Atoll to dive the Elbow, Half Moon Caye Wall and the Great Blue Hole. Nitrox is available upon request.